Over time, the Raspberry Pi has made a good name for itself as a basic, economical system that supports numerous specialty applications. Now, the Raspberry Pi 2 Model B offers even more computing performance than some of the older desktop PCs because of its quad-core processor and increased main memory capacity. The advent of the ARMhf edition of the Linux distribution Q4OS has given rise to a slim Debian derivative that makes it possible to use the Rasp Pi as a full-fledged alternative to the more cumbersome desktop PC. To use a Raspberry Pi in place of a full-fledged desktop environment, you need at least a 4GB, or preferably an 8GB, SDHC or microSD card along with a suitable ZIP archive of Q4OS . It is important to remember that the speed class of the SD card will affect the latency times of the Rasp Pi. Speed class 10 or UHS class 1 cards allow for a maximum transfer speed of some 10MBps. These cards are much better suited for use with the Raspberry Pi than the slightly lower priced class 4 or class 6 cards. The speed class is printed on the card. To begin, download a ZIP archive for Q4OS; it is about 385MB in size. Then, unzip the archive into the directory of your choice. Once decompressed, an image file will appear ready for installation on the memory card. If you run Linux, you can perform the installation using built-in tools. The copying process lasts a while, and the system does not provide any response during this time. (See the "Coreutils 8.24" box.) After a few minutes, the image will be completely installed on the SD card. Once you have emptied the write buffer via the sync command, you can remove the card from the card reader or computer. One annoying characteristic of the dd utility is that it fails to provide any status information when running a copy or conversion operation. Since the beginning of January 2016, this shortcoming has been remedied by means of an update; however, the updated distribution was not available for the Raspberry Pi at the time of writing. It will become available when the most recent version 8.24 of Coreutils arrives in the repositories. At that point, dd will be equipped with a status indicator. For Windows users, it is a good idea to get the freebie program Win32 Disk Imager  to make sure that the memory card is bootable. Once you have opened the window for this program, all you need to do is enter the path to the image file in the Image File selection field and then enter the device you are using in the Device field. Afterward, you should click at the bottom of the window on the Write button. When writing has completed, a mouse click on OK closes the program. When selecting the destination device, you should scrupulously make sure that your entry is accurate. This is especially important for systems to which USB sticks and other external bulk storage devices, such as hard drives, have been connected. Otherwise, a misspelling or other minor oversight may lead to the data on the device being permanently deleted. After inserting the SD card into the Raspberry Pi slot, you can start the machine. 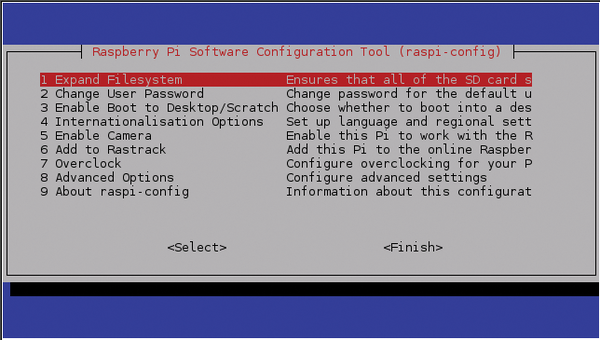 When the login screen appears, you should log onto the system as the user pi with the password raspberry. 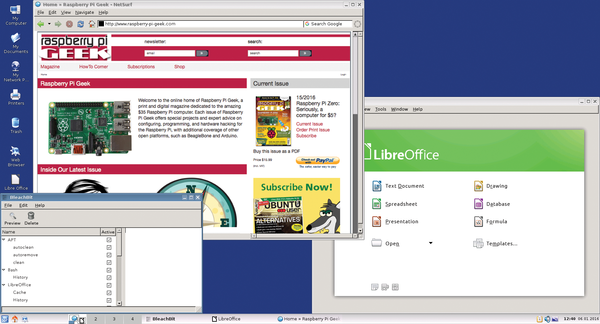 After authentication, Q4OS boots quickly into the Trinity Desktop Environment (TDE), which is an offshoot of KDE3 (Figure 1). Figure 1: TDE functions as a user-friendly graphical interface for Q4OS. command. The program has an Ncurses menu structure, which offers various options for modifying the system. You should select the first option in the menu, which is Expand Filesystem (Figure 2). For the resizing to take effect, you need to restart the Rasp Pi. Figure 2: Basic configuration under Q4OS is done in the terminal.